7 rides. 3 hours. 1 goal. Smart, responsible Blake always has to watch his thrill seeking brother, Quinn, who sometimes crosses the line. 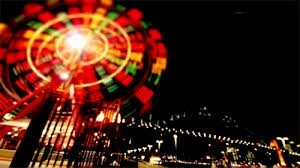 But the ride gets bumpy when Blake has to hunt Quinn down and save him from getting trapped in a carnival ride that holds its customers forever. Determined to save his younger brother, Blake has to ride 7 rides- each that represent a horrid fear, by dawn, but will Blake be able to save himself and his brother before the clock stirkes 6:00?